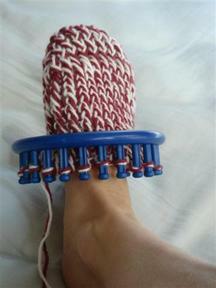 for years, i wanted to learn to knit socks. 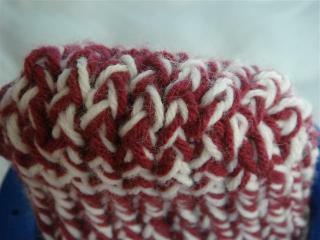 last winter, i finally did it, using 5 double pointed needles and a lot of dove chocolate. i learned to knit the traditional cuff-down, heel-turn-gusset-stitches-picking-up, graft-the-toe-together-when-you're-done sock, and what i would call the logical toe-up, no-seams-anywhere, no-gusset-stitches-to-pick-up, never-run-out-of-yarn sock. i like the latter. 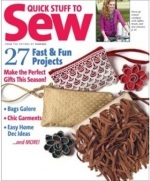 :) since then, i have been ruminating and cogitating and stewing on how to do this on the knifty knitter. earlier this week, it came to me, and i spent this afternoon making a prototype to test my theory. the idea was that i could make the toe exactly like making a heel--i knitted one row on half the pegs of the blue loom (12 pegs), then started short row decreases until i was down to half the original number of pegs (6 pegs). i then did "long row" (i have no idea what it is called in reverse) to add stitches until i was back to the original 12 pegs. this gave me a cup shape for the toes to fit into, and there was no seam. 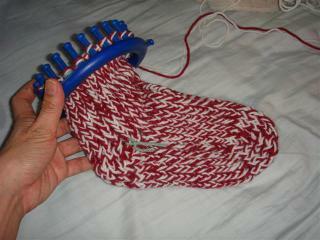 on the whole, this sock is pretty good, although the gauge on this loom makes the sock pretty thick. my mama got a set of the new long knifty knitter looms for me (thank you, mama! ), they are smaller gauge so i'll try again on one of those. since finishing this sock earlier today, i found a yahoo group for loom knitting socks--duh, i should have looked there first. oh well, i like figuring stuff out on my own--it makes me feel smart.